Copy Up To 20 Flash Drives At Once | OhGizmo! By Chris Scott Barr on 03/21/08 • Leave a comment! Have you ever had a flash drive that you needed duplicated onto another drive or two? I’m sure that it’s happened once or twice, but since most computers have a plethora of ports, it really isn’t an issue to copy the data. However, if you’re working for a company that needs a few dozen or more such drives, that can be a whole different issue. 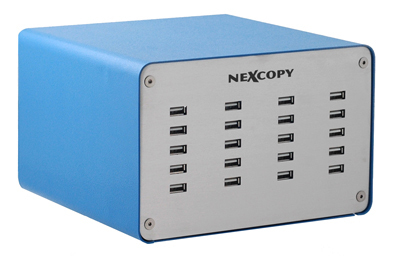 This device makes it simple to copy information over to 20 different USB devices at the same time. All you need to do is plug it in and go, it’ll take care of the rest. I’m sure that this would save a lot of time and effort, were you someone that made a lot of copies. The average Joe probably won’t get much use out of it, especially for $1299.